Mobile Optimisation, Responsive Web Design, Mobile Websites………..arghhhhhhhh! What should I be trying to do here? One thing! Your goal should be delivering a comfortable experience for your customers while browsing your website from any web enabled device. Simple. No surprise perhaps, seeing that out of the world’s 4bn mobile phones in use, 1.08bn are smartphones, and apps have become a global phenomenon. Apple’s App Store alone has now reached 25bn downloads; tracking at 1bn downloads a month, a figure nine times greater than the number of burgers sold by McDonald’s! 86% of people are using their mobiles while watching TV!! And that was in 2010 ?? We’re two years past that and Apple alone has sold over 184.542 million iPhones since October 2010!! Then you have to remember that the Samsung Galaxy has almost equally as many sales and those are only 2 of the big players in the mobile smartphone market. The mobile market is huge and everything is getting smaller, the days of having websites that you view on a desktop are slowly dwindling and everything is converting to fit the appliance it’s working on. Websites are only a destination; Mobile Apps can send notifications, utilise native functionality on smart devices and are far more flexible. 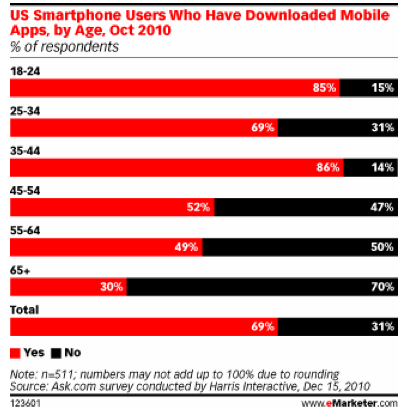 Almost everyone who owns a mobile has it within arms reach and the second it beeps they pick it up immediately. Unlike a radio or tv ad that may just play in the background and be ignored, there is no ignoring at TXT or Push Notification. The better question is can you afford not to be in the mobile market ? Make sure to speak to mobile app specialists if you do decide to utilise this exciting new marketing channel. They can help you figure out everything you need to know to get the most out of your mobile marketing experience. AppThat is New Zealand’s newest and most exciting Web Design, Search Engine Marketing and Mobile App company. Our head office is situated in the beautiful city of Tauranga with a local presence around New Zealand in Wellington, Hamilton, Auckland and Christchurch. We’ve arrived just in time to help all types of businesses big and small join in on the Mobile Revolution! Of course I’m a little biased on the subject but you can’t deny Mobile Devices are getting ‘smarter’, ‘lighter’ and ‘faster’ with every season that passes. More and more kiwi’s are relying on their mobile phones not only to communicate and interact with widening communities but more importantly, make purchasing decisions and even act on those decisions right from their devices. Anyway, I’m not here to spout on about how great Mobile Marketing is, I’m here to introduce AppThat and say “thanks for having us”. Take a look around our site, you’ll find some amazing information on Mobile Technologies, Search Engine Optimisation (SEO), Web Design and Mobile Apps. Our blog will be packed full of helpful information so grab your coffee, sit down and have a read. Being based in New Zealand doesn’t stop us from helping clients from Australia and further abroad. No matter what the project or specification our talented team at AppThat loves to design for mobile and the web and we offer our full range of services to all of our overseas customers. At AppThat our goal has always been not to just produce marketing solutions for our clients but to partner with them and make sure they’re getting the results they need from their marketing efforts. There’s a lot to take into consideration when thinking about what we’ll call e-marketing. We don’t just design websites or apps for people, we show them how to utilise those tools to market their brand effectively. Don’t forget about online advertising and organic online marketing techniques, they all play a role in an effective strategy. We talked about the AppThat blog before and we want to share our expertise not only with our clients, but anyone who’s interested in learning more about marketing their business online and would like to give it a go themselves. We’re a friendly bunch at the AppThat offices so if you’ve got a question pick up the phone and give us a call, we’d be more than happy to help.